I love bacon, but I don’t like eating meat. I love the salty, smoky flavor bacon can give a sandwich or a salad. Given this, I got really excited when I saw this recipe for eggplant bacon. I like eggplant, I like smoky, I like to experiment in the kitchen, so let’s try it. I wasn’t exactly sure what I would do with the bacon once I made it, but I knew I would come up with something. I borrowed mom’s mandolin and Bob sliced the eggplant very thin for me. The fist baking went ok – but I have to remember to only use one rack in the oven at a time. The marinade was easy to make and the eggplant strips looked so good waiting to go in the oven. My first sheet, I way over cooked. The recipe called for a 350 degree oven and about twelve minutes. By 8 minutes my eggplant was charred, so I reduced my oven temp to 325 and kept the next sheet in for five minutes. This worked well. Really well. I’m also a sucker for a good tomato mozzarella sandwich. I love the combination and decided – why not add bacon? I had some bread from lunch Saturay and I toasted those and then added a little pesto, the eggplant bacon, mozzarella, and tomato. I did begin to add some cabbage, but ended up ditching that – it just didn’t add anything. The result – fantastic. The eggplant actually added something really delicious to the sandwich and it satisfied the minor bacon craving without requiring that I eat meat. This is a definite do again, but I have to be cautious with the slices and the cooking time. I also have a cute picture of Leia and Tigger. They do like to curl up together and I think it’s just adorable. I fully admit I love cake. It’s more the icing or filling, especially if it is a creamy filling that I just find myself slightly addicted to. I also get cravings for specific cakes – strawberry shortcake, lemon cake, vanilla cake with vanilla icing. Lately I’ve had a craving for a specific cake, but I have no idea what it is called. I had it in Austria and at our local German restaurant, but they just call it a Cream Cake. I looked up Cream Cake and Creme Cake, but didn’t find what I was looking for. Well, I found a picture, but not much else. This is about as close to the cake I had in Austria as I can get – slightly thinner layers and more cream, but it’s about what I wanted. The picture, however, is about as close to the actual cake (or a recipe) as I got. But I did find a different recipe that looked promising and since I had a little time between school assignments, I decided to give it a try. My first clue that this was not going to be the same should have been the cake batter. This is brioche cake, which is a cross between a bread and a cake. It’s light and has a good taste, but the texture was wrong. Not bad, just not what I was looking for. It also took a long time to make. I mean a really long time. Because this is a yeast cake, there is rising to be done. Three rises to be exact, which means multiple hours. I started the cake at 11 am and it went into the oven about 8pm. That is a long time to be waiting for cake. But there is a cream filling. Caramel cream. I do love caramel and I do love cream, so I kind of figured, how bad could this be? (Not bad at all, it turns out.) So I start by making a caramel because well …. it’s in the recipe and its caramel. I then made the caramel into a custard and put it in the fridge over night. Before I assembled the cake the next day, I mixed up some whipped cream and folded the custard and the cream together. This worked. I could have happily eaten just the cream filling. I asked Bob to slice the cake in half for me as my knife skills are not nearly as precise as his. He did, and we got nice even layers. I added the caramel creme to the middle and sprinkled some powdered sugar on top. Results were good. Not amazing, but good. The filling is a keeper, but I think I still need to do some more searching before I try again. I have a new obsession. Yes, I get obsessed a lot with food, good food, but these are taking over my brain. Quinoa tacos. I found this recipe at a new favorite cooking blog – Minimalist Baker. Dana is pretty much a genius as everything I’ve made from her blog has been amazing. General Tso’s tofu – check. Pina Colada popsicles – check. This quinoa taco stuff … holy cow! This started out as just another experiment and now I’m trying to figure out all the ways I can make quinoa replace meat. Possibly sloppy joes or a version of BBQ pork sandwiches? (Don’t worry, Dad, I’m still making regular pulled pork this weekend.) Bob was on board with trying it, although he did sound a tiny bit skeptical when I first mentioned it. But … I’ll say this for the man, he is willing to let me try crazy stuff so long as I am willing to admit when it doesn’t work. Fair deal I think. I took two cups of quinoa (leftover from another meal) and added a half cup of the double roasted salsa. I love Rick Bayless and think he’s amazing, so when I do buy jarred salsa, I go to him. The double roasted tomato is smoky and spicy so I think it adds a lot to the quinoa here. I also used about 3/4 teaspoon garlic powder (because I accidentally dumped it), 1 tablespoon nutritional yeast, 2 teaspoons cumin and chili powder, little bit of salt and pepper and a little bit of olive oil. I mixed well and spread it on a parchment lined baking sheet and baked it for 25 minutes. While this baked, I grated some leftover cheese from my favorite cheese shop. I will fully admit, that when it comes to cheese, I think high quality cheese without fillers is really important. Yes, its more expensive, but trust me on this – this is not the processed cheese product of childhood. (Although I do have a soft spot for processed cheese product.) I went with an alpine style cheese because it’s what I had on hand. Any hard cheese will do, but think stronger cheeses like cheddar or Gruyère or an alpine. For the salsa, I went with my favorite combination – tomato, red onion, cilantro, lime juice and salt. That’s it. Chop the tomato and onion to desired sizes, pick and chop a few cilantro leaves. Squeeze half a lime over the whole thing, sprinkle a little salt on it and let it sit while the quinoa bakes. For the shells, I went with conventional white corn taco shells. Yes, I could have made my own or used soft shells, but I was going for childhood memory tacos, so hard corn shells. These were so good, I think I like them better than the real meat stuff. Yes, I’m weird, but trust me – these are so good I can’t imagine anyone who wouldn’t like them. Spice and heat can be altered with the type of salsa you use and the amount of chili added. But really, this is totally great. I even made a taco salad the next day – lettuce, tomato, onion, the quinoa, a few crumbled corn chips and a cilantro lime dressing. How was that …. there were two clean plates by the end of lunch and I’m probably making this again in a week. And possibly more often than that. I should mention that it has rained here this past week. A lot. 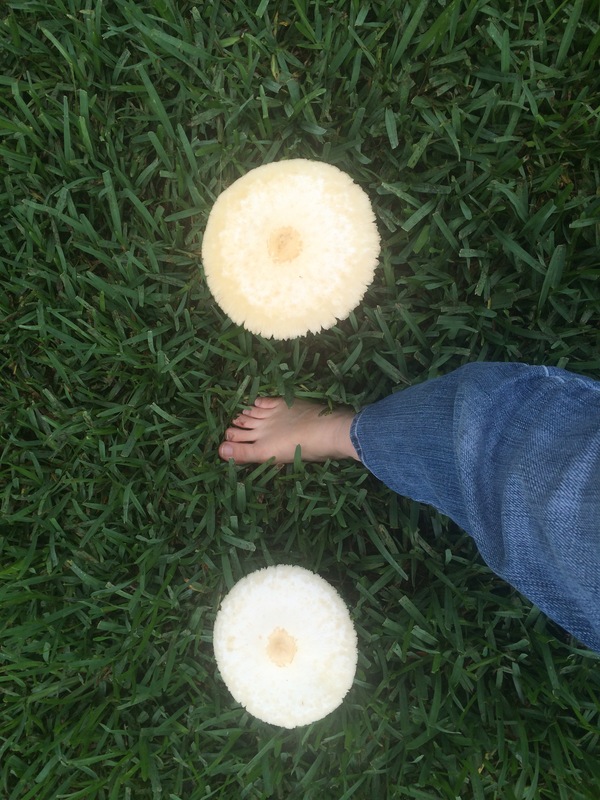 We had the tropical storm come through that made mushrooms grow in my backyard. Big mushrooms. Larger than my foot mushrooms. Even the cats didn’t want anything to do with these mushrooms. But, with all of the rain, my basil was happy. Happy and getting very big, so I decided to make one of my all time favorite (summer) comfort food dishes – pesto. I took the basil from my herb box – the one Leia doesn’t sleep in so I have some herbs – and made a garlicky pesto with hazelnuts. I had some beautiful parmigiana from our last cheese box, so I used that to make a bright and fresh pesto. I also made one of my favorite breakfast comfort foods this week – waffles. Real, buttermilk waffles. Bob loves these and Sunday morning, we decided that waffles were in order. I *may* have overfilled the waffle iron once, but it didn’t matter – it was what came out of the waffle iron that was important. Crispy outside, tangy, buttermilk waffles. None of this was very fancy, and none of it was particularly exciting, but it worked this week. We are still getting use to not having Jessie around. I’m still watching where I step and looking for her when I come home. The cats have been a big help, although I do get a little teary-eyed when it comes to feeding them dinner. Mom compared it to the kids going to kindergarten or off to college – it just feels different and it takes time to adjust. But in the meantime, I still have the cats, Bob, school, work, the house and a possible trip to keep me occupied. And, hopefully, some new and interesting foods to experiment with this summer.